Summer 2018 comic book movie hype continues with the supple vigor of Deadpool 2. After the foul-mouthed regeneratin’ degenerate took the world by storm on Valentine’s Day 2016, Deadpool is back in a sequel promising the X-Men movie universe debut of Cable, Domino, X-Force and more! Below you’ll find my list of the top starting reads before or after seeing Deadpool 2. So put on your bathrobe (and nothing else), sidle up next to a fire, and enjoy some Deadpool comics! Kick things off with Deadpool’s earliest days, fighting against, alongside, and sometimes both against and alongside Cable and X-Force (in the series X-Force (1991) #19 to #31). 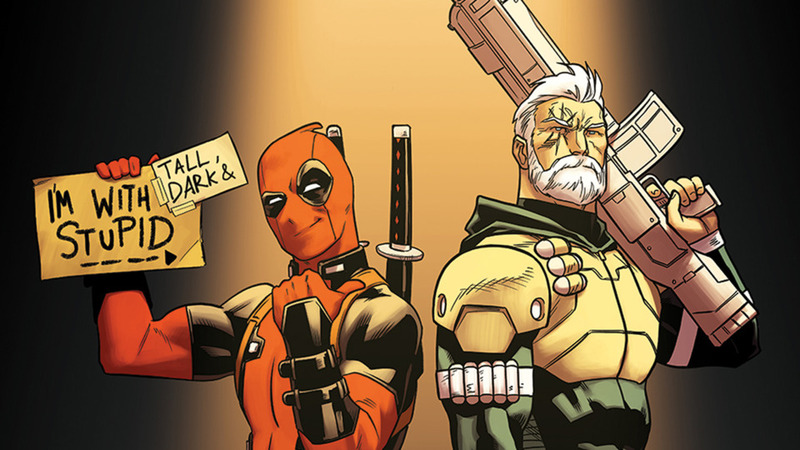 Writer Joe Kelly built up the Deadpool we know and love today, introducing characters such as Weasel and Blind Al to Deadpool’s first ongoing solo series. The series began in 1997 and certainly feels of the era, but it’s a great read even today. My favorite Deadpool and Cable team-up comics in a series that ran from 2004 to 2008. This is a great introduction to both characters, and honestly one of the best starting places for new fans of Deadpool comics. While frequently uneven, writer Daniel Way’s lengthy time writing Deadpool (2008 to 2012) defines much of the character’s quirks during his most aggressive ascent into uber-popularity. Plus, Way wrote the script for The Deadpool Video game , which is still my favorite multimedia Deadpool event! From 2010 to 2012, writer Rick Remender (with artists Jerome Opena and Daniel Acuna) brought Deadpool onto Wolverine’s Uncanny X-Force squad. The result is one of my favorite modern Marvel comics, and likely my favorite Deadpool comic of all time. New readers who want to know where Deadpool is at in the current state of Marvel “Fresh Start,” can start most easily here, with the 2012 series written by Duggan and Posehn. Duggan remained on the Deadpool series and various spinoffs through 2018. Appropriately enough, Deadpool’s most popular and enduring graphic novel comes in an out-of-continuity tale of him killing everyone in the Marvel Universe. In the vein of all things X-Force, Deadpool’s coming for them hard! Wonder what a Deadpool and Thanos crossover might look like in the wake of colliding movie franchise hype? You won’t come much closer than the Deadpool and Thanos team-up that finds them wooing the same mistress: Lady Death! Speaking of crossovers, Deadpool writer extraordinaire Joe Kelly returned to the character in this team-up book with everyone’s favorite wall-crawler. For my money, it’s the best comedic Deadpool book of the post Secret Wars Marvel era. Joe Kelly’s Deadpool run and Cable & Deadpool were one of the first comics I’ve read. I think I should revisit them sometime.